Being in the ‘flow of the Universe’ is a coveted place to be. It means you’ve let go of your need to control circumstances outside of your control. You’ve detached from the outcome and are enjoying the present moment. But what happens when you’re feeling in the ‘flow’ of abundant energy but that money flow isn’t feeling you? As we raise our frequencies we will undoubtedly watch some of our relationships fall to the wayside. Not out of lack of love but simply out of frequency mismatching. When one person’s frequency either goes up or drops consistently, it can cause some issues in many relationships. And often times an expression of jealousy will take over the lower frequency energies. It usually happens out of fear. Fear that something isn’t right anymore, but its root is unknown due to the intangibility of energy. In today’s video I will share a personal story of how I discovered someone I knew was unconsciously hijacking my money flow through a series of ‘coincidences’ that turned into a pattern. Watch the video below for the steps I had to take to reclaim my money flow, while protecting myself from a future finance hostage situation again. 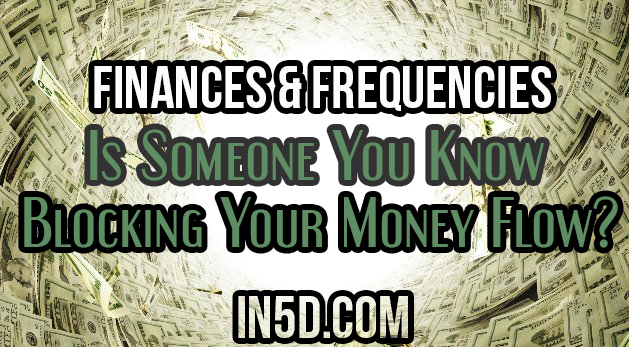 Tags: Finances & Frequencies: Is Someone You Know Blocking Your Money Flow?